Most medieval sauces had some sort of acidic ingredient such as wine or vinegar as their base. Far fewer would be creamy milk-based sauces. 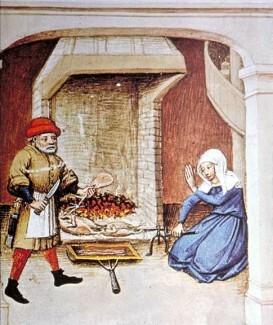 This is what is seen in most of the medieval cookbooks found in England or France. It is thought that possibly one reason for this was that people had less control of heat when cooking compared to what we have today. Cooking over coal or wood meant that a sauce could be easily ruined by accidentally boiling or overheating it. Let’s be honest, most dairy-based sauces contain flour or milk which can very frequently end up lumpy if not cooked carefully. The same applies to making custard – boil it and it can curdle, losing the smooth silky consistency that makes it so appealing! 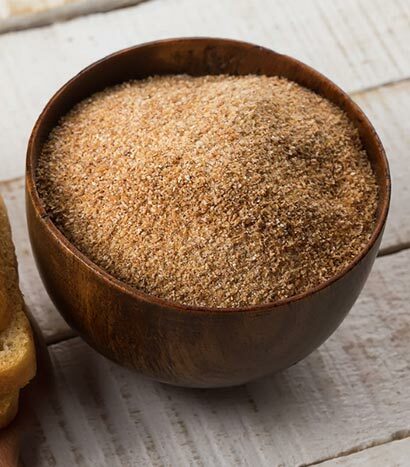 With medieval sauce making, it was almost always a case of using breadcrumbs for thickening. Many fishdishes were served with their own special sauce (usually containing herbs such as parsley). Meats were basted during the roasting process. Sometimes a sauce would mask a the taste of food that was ‘on the turn; sometimes it just added extra flavour and sometimes it just made a dish more moist and edible. In medieval cookery, many different types of sauce were made as it depended both upon the context in which they were to be used (simple meals or banquets) and also what ingredients were available to the cook at the time. Strong, herb based sauces thickened by including breadcrumbs – these made great accompaniments to fish dishes. Click here to see the medieval fish recipes page for more details. Rich basting sauces made from red wine and spices were ideal for the basting of meat whilst it was being roasted on a spit as the image on the left portrays. This is the kind of dish that was common in the kitchens of the rich and nobles including many castles. What is interesting about these examples is that they have been handed down over centuries to today. Recipes such as cod in parsley sauce and roast beef with a red wine basting sauce are some of the ‘evergreens’ of the English diet!